These attributes predict job critical success factors including how quickly someone can learn new tasks, which types of tasks they prefer and will probably gravitate to, and how they will prefer to work by Interpersonal Style, Work Style, Social Style and Emotional Style. 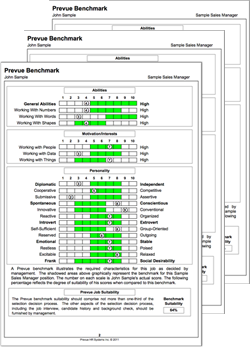 Prevue predicts which tasks they enjoy, which tasks will result in high levels of procrastination, how they act in a team environment, their preferred work mode and co-worker interactivity. All of these factors can be a great indicator to how resilient a potential candidate will be to difficult situations or tasks. Measure 20 different aspects of an applicant. Realize the potential of your hires.